Gone are the days when the health supplement industry was a haven for big claims filled with empty promises. The Growth-Boom Pro difference comes from years of innovation by dedicated Prof. Robert Kissinger in our GrowTaller Labs. He came up with the solution to help folks just like you see the world from a new angle, both physically and mentally! Because Growth-Boom Pro is. . .
We encourage skeptics to try our one-of-a-kind formula. Not only will you be convinced, you’ll be taller too! That’s what we call a win-win! We take your health and wellness seriously and that is why we didn’t leave any stone unturned when developing this product through exhaustive research surveying all avenues of information. We arranged whole teams of professionals from all corners of the earth and anthologies of critically-reviewed research documents on the topic of height enhancement to give us the most informed starting point for this impressive endeavor. Simply nothing compares to the impact this all-natural product can make on the health and wellness of our consumers. The benefits are nearly infinite. Greater Height is in Your Future! 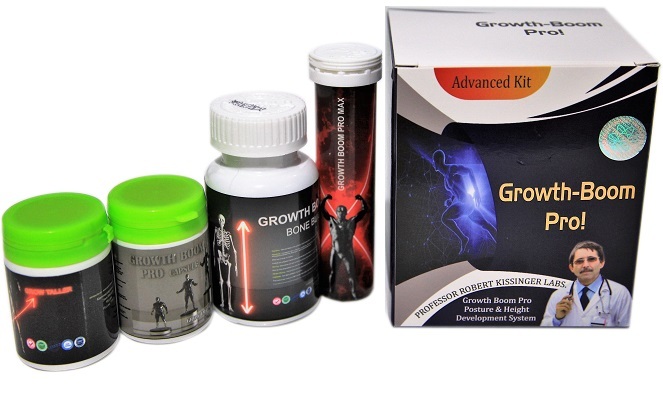 The special blend of great-tasting, nutrition-based ingredients in the Growth-Boom formula is the answer to your grow taller aspirations. Its health benefits extend far while your height also increases. Whether you’re younger or older, a man or a woman, Growth-Boom is what you need to help increase your overall health and wellness by providing the nutrients necessary to facilitate bone growth.